An ideological dive into what makes Steve Rogers Captain America. A story that asks what it means to carry the shield. The popular story told in the Secret Empire event continues to have incredible impact on Marvel’s current Captain America run. Ta-Nehisi Coates has found a way to tell a fresh story while seamlessly connecting it to this previous event. 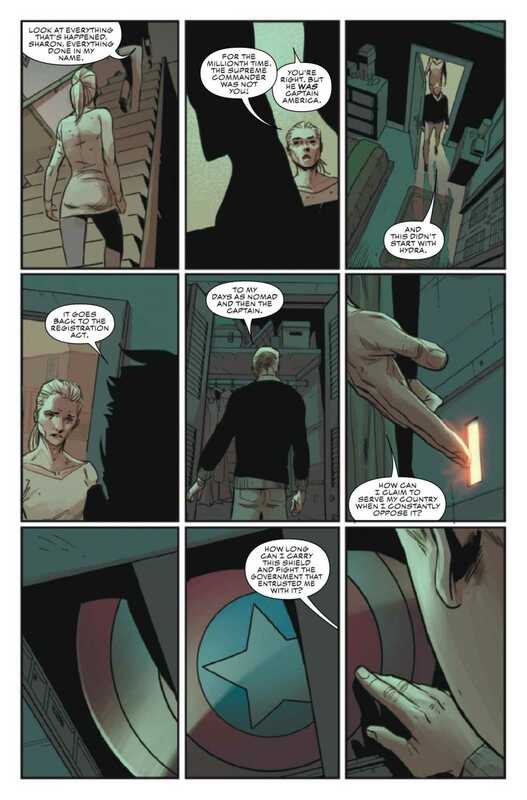 And in CAPTAIN AMERICA #7, Coates hones in on Steve Rogers as he faces an inconceivable charge of murdering Thunderbolt Ross. The issue centers around the murder of Thunderbolt Ross and the U.S. government’s attempt to question Captain America regarding the event. They suspect it was Steve due to recent tensions between the two, as well as a damnable piece of evidence uncovered. To help establish a plan of action, Sharon Carter and Steve sit down with a legal professional to discuss their limited options. It is in these moments of tension that Steve and Sharon’s chemistry truly shines. Steve’s initial hopelessness at the situation is immediately contrasted with Sharon’s fiery passion for him and what he represents. She serves as a catalyst for Steve’s resolve and reminds him of the dreams and ideals they’re fighting for. Coates presents an authentic representation of Rogers, the man dedicated to preserving the ideals of liberty, while acknowledging the limits of any person to embody such a feat. Throughout the issue Steve draws the focus away from himself and to Sam Wilson, Bucky Barnes, Sharon and everyone else fighting for America’s ideals. It’s almost as if he breaks the fourth-wall and knows the average reader will focus too much on him. One read of this issue and readers will have no doubt as to the integrity of its central character. Alex Ross’ cover art hones in on one of the key questions posed by this story: Can Steve truly be separated from the ideals his shield stands for? 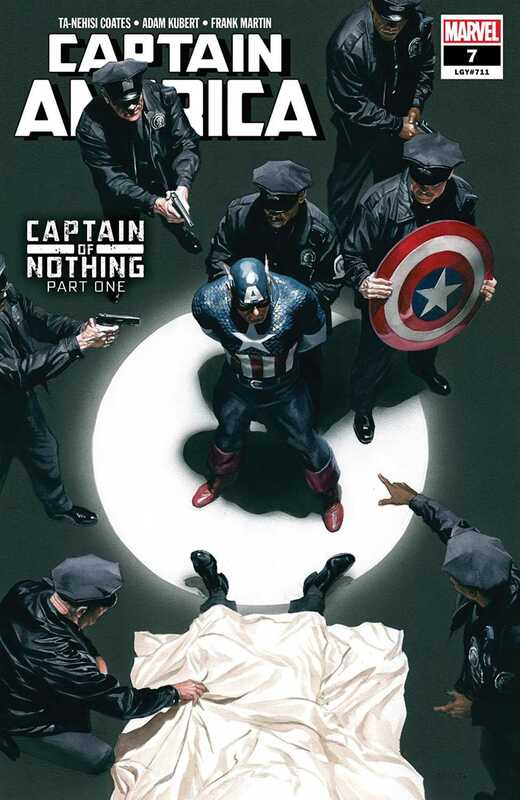 The cops, having confiscated the shield, surround Steve, a scene meant to startle the reader by breaking apart an image of Captain America often taken for granted. 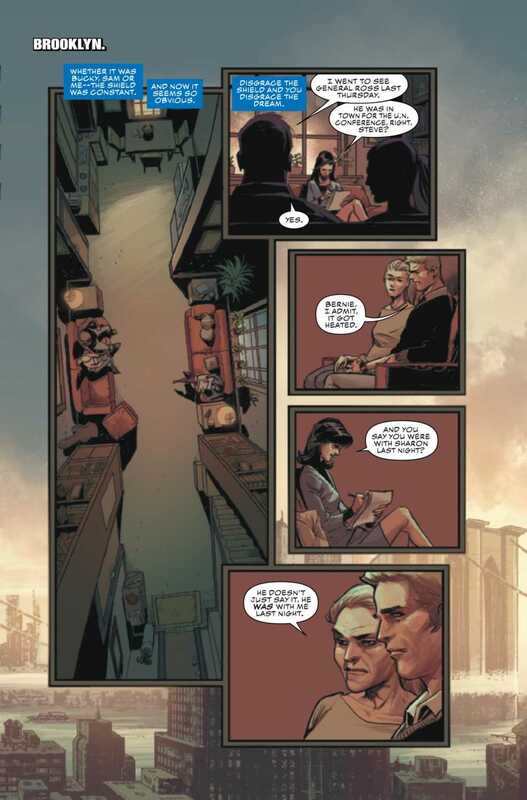 Adam Kubert takes the reader on a journey through dark panels that uses shading to conceal different aspects of the scenes. 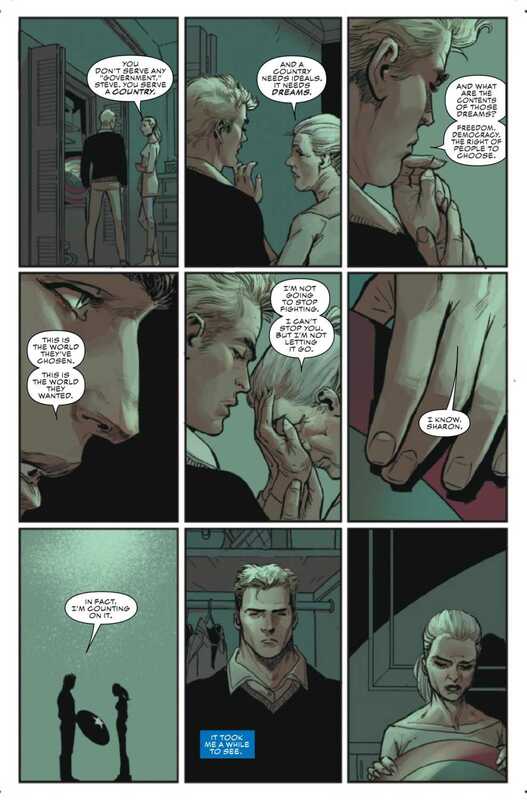 This adds to the mysterious vibe one gets reading the story, as if the reader is joining Steve and Sharon as they navigate through their turmoil. Coates has begun an intriguing saga into the self-identity of Captain America. The story masterfully brings the reader alongside Steve by asking important existential questions. It will be exciting to see where this suspenseful series is headed. How well do you think this storyline fits within the Captain America mythos? Let us know in the comments below! I love Steve’s question, how he wonders if he can represent a country he opposes so often. Such a great question for the character to ask! And asking about the content of the American dream and realizing this is the world the people have chosen…Coates is doing something really cool here.